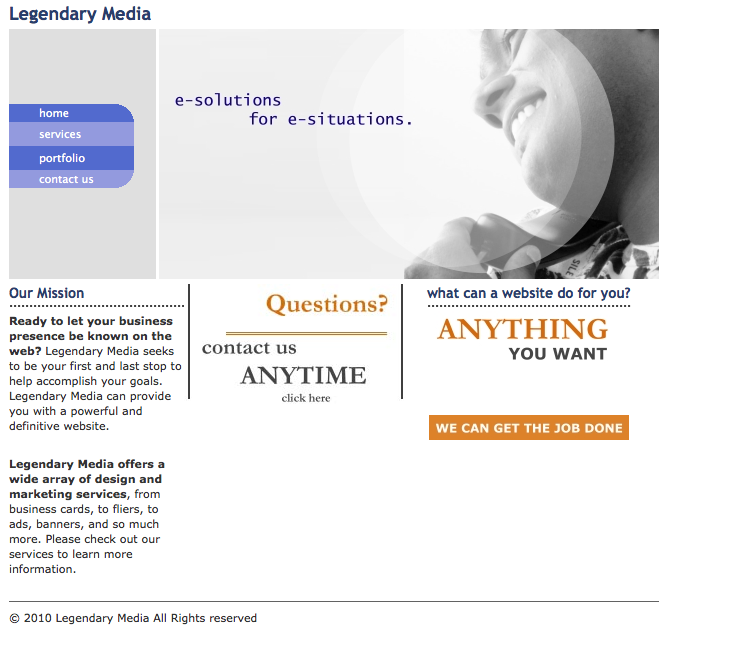 Legendary Media was a concept I came up with when I was a young coder in college, trying to make a few extra bucks on the side while finishing up my degree. Today it has grown into a complete web business with all types of offerings. Working with Jon Yvon has really taken this thing to the next level. We are always working, and in this economy that is a really good thing. We’ve been so busy helping people with their websites over the past four years, that ours had become tremendously obsolete. It has been a peeve of mine for awhile because while I still like what I created way back in 2005, it is not a good representation of what we are capable of doing as a company today. A screenshot of the old website homepage. I have been working on this site for awhile and today it goes live. Is it perfect? No. It will grow like everything else on the internet. I have been hesitant to put this out there because it’s not perfect, but when you take that approach it could be weeks, months, and even years before your vision goes live. These days I like to take the Mark Zuckerberg approach to launching my own projects: If it’s somewhat ready to go, get it out there, let people use it, and we will make enhancements along the way. That is what I am doing here, and it will work. Like everything else on the internet, it will evolve and grow.